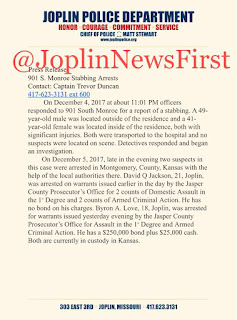 (64801) — The second person being sought on a warrant for murder is now in the custody of the Joplin Police Department. A warrant of first degree murder was served at 901 S Jefferson and Artilius Jordan, 47, was taken into custody without incident. 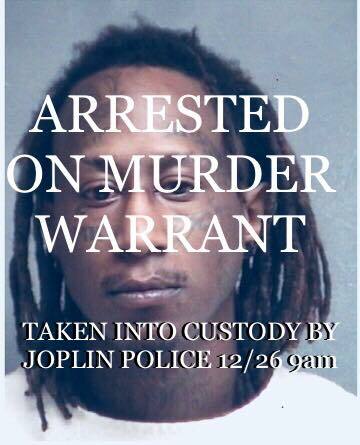 On December 26 Moses Ramsey was taken into custody by Joplin police at a residence near 21st and Empire, without incident. The warrants served are for the murder of Sean Harris on Christmas Eve at 627 S Byers. These are wanted men. If you know the whereabouts do not approach them. 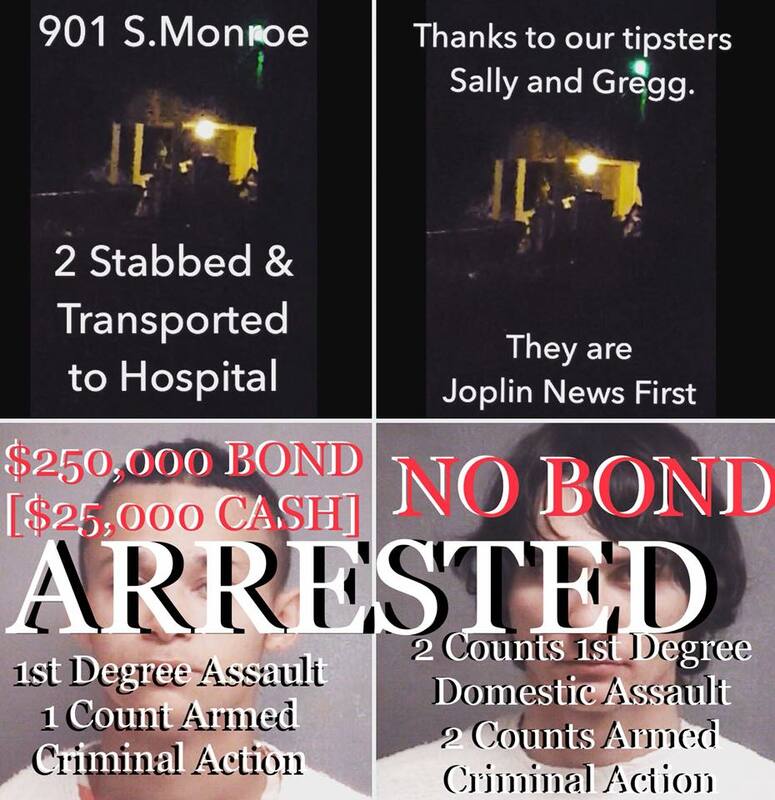 Contact the Joplin Police Department immediately 24 hours a day 417/623-3131. Or simply dial 911. ​Update #1: The suspect in the shooting is identified as Lonnie L. Boyd, 36, Joplin. He is wanted for domestic assault in the first degree and armed criminal action. His location is unknown, we are seeking his arrest. He is said to now have short braided hair. ​On 12-21-2017 at 11:38pm we received a call to 5501 East 32nd, Gastrip, for a shooting. Officers arrived and found a 29-year-old female with a gunshot wound to her hip. She was transported to a local hospital and is in surgery, as of this morning. ​The suspect hasn’t been arrested at this time. This is however an isolated incident, and is a case of domestic violence. The investigation continues. (64804/64801) -- Joplin doesn't have a 24 hour Christmas music station! So we have created a playlist/radio that plays all the CLASSICS. If you remember Magic 93.9 FM, Lite Mix 95.1, KOBC Christmas 90.7 from years past in Joplin you will remember all these classic songs! Bing Crosby, Nat King Cole, Barry Manilow, The Carpenters, Amy Grant, Brenda Lee, Burl Ives. (64801) -- Congratulations to the MSSU Graduates. What a great accomplishment! ​ The Joplin area had seen an increase in thefts of packages that were delivered and left on porches. Other surrounding communities saw the same activity. With the assistance of eye witnesses and home-surveillance videos, the Joplin Police Department was on the look-out for an older style Red Ford Escape and a white male suspect. That information was supported by other area departments sharing information about a Red Escape being the suspect vehicle. The investigation had identified a partial license plate as well for the suspect vehicle. ​On December 2nd, 2017 at 7:19pm a Joplin Police Department Patrol Corporal was on regular patrol at Valley and St. Louis. He saw a red, 2003 Ford Escape turn west onto Valley from St. Louis. The license plate was consistent with the license plate we had, and the vehicle matched the surveillance videos of thefts we had reviewed. The officer stopped the vehicle as it pulled up to 1609 East Valley to further investigate. 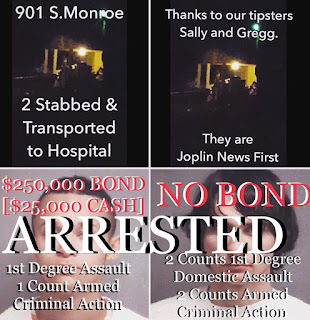 The driver of the vehicle, Phillip L. Bishop, Joplin, was wearing the same clothes as he was captured on video the day prior committing a theft from a porch in central Joplin. ​Detectives and Officers searched the residence they stopped the vehicle at, and located a large amount of suspected stolen items. They were all brand new in different stages of packaging and boxes. More than 130 separate items were seized. Bishop was initially booked on a traffic offense and misdemeanor stealing for the theft the day prior. Detectives are working on linking the property to the theft reports and identifying victims, and additional charges are expected. Anyone who has experienced a package theft is encouraged to report it to the law enforcement agency in which jurisdiction they live. That initial report is needed before we can verify who owns which stolen property. We also ask from patience from victims as this process is time consuming. 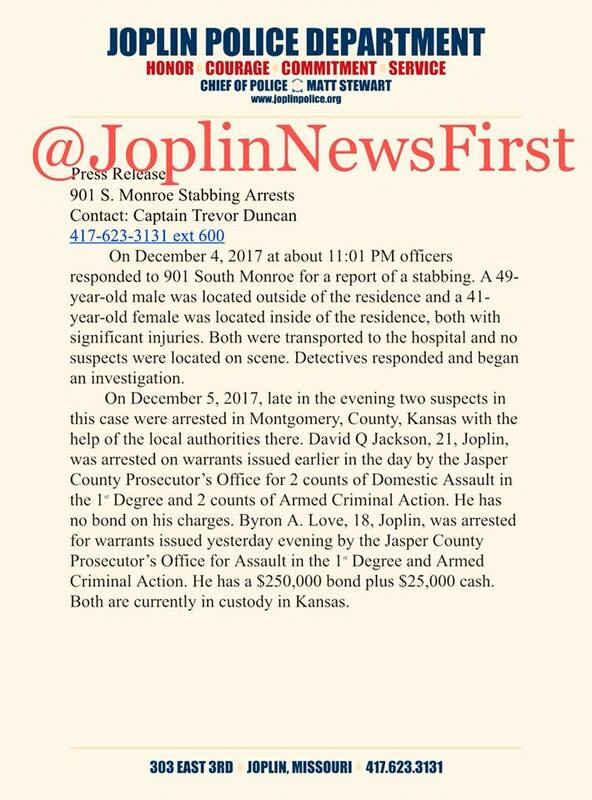 On December 4, 2017 at about 11:01 PM officers responded to 901 South Monroe for a report of a stabbing. A 49-year-old male was located outside of the residence and a 41-year-old female was located inside of the residence, both with significant injuries. Both were transported to the hospital and no suspects were located on scene. Detectives responded and began an investigation. (64804/64801) — The Children’s Center of SWMO need your financial donation as they increase their monthly budget and pay for this new building that doubles their size. Please print this NAP TAX CREDIT information sheet and share it with your tax preparer or financial advisor about a larger donation. For larger donors you can take advantage of the NAP TAX CREDIT. Let's say you owe $1,000 in income tax to the state of MO for 2017. - Make a donation of $500 supporting the Children's Center. - Because of the donation, you receive a 50% NAP tax credit from the state of MO and now you have $250 in credits that you can use to reduce your taxes. (75092 - Sherman TX) — Just about an hour North of Dallas this mall is dying. This is right at 9:00 in a Saturday night. Sherman is population 45,000. Joplin is population 50,000. I hear a lot of people say that ‘Joplin is dead’ and ‘there’s nothing to do’. This is a tour of the Midway Mall in Sherman TX. Talk about dead 💀 the theater is showing IT and Madea Boo 2 tonight. Recent statistics say that 1/3 of malls will close in the next 5 years. No more hanging out at the food court. Going to Vintage Stock or seeing the latest styles at American Eagle here at this mall. According to this 2009 blog this is considered a Tier A Mall with 600,000 square feet. This area is known as Texoma (TX/OK line). Durant, OK/Denison, TX/Sherman, TX with a population base of 150,000 people it should be surviving along this I-75 corridor instead of looking like a movie set for Zombieland. The only thing that has changed is that more large stores have closed since the article. JC Penny left 10 years ago. Bealls, Sears, Mervyns, Old Navy, Goodys and Famous Labels all have exited since 2011. But they still continue to leave some of the lights on in hope of what? 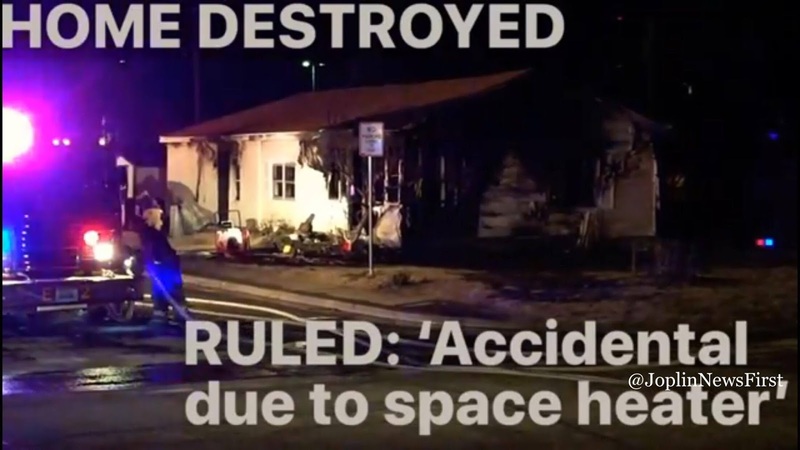 (64804) – “Fire on Willard was ruled accidental due to a space heater,” Deputy Fire Chief Andy Nimmo tells Joplin News First. 1) Never leave an electric space heater unattended while it is operating. Don't leave it on and leave home. 2) Make sure it is plugged directly into the wall. If you must use an extension cord it needs to be 14-gauge wire. If it's just a small wire it will cause the wire to get HOT. Before tripping your breaker in the fuse box it could heat up and start a fire. Never run any cord under a rug either. 3) Buy the right heater for the space and make sure it has a safety switch. If a child or an animal knocks the heater over then it would turn off automatically. 4) Some space heaters can make your electric bill go up $75-$100 per month. They are not energy savers, they are energy suckers. So bundle up. Dress in layers during the day. More blankets at night. Batman? Hello? No The Spotlight is for Black Friday Sales! 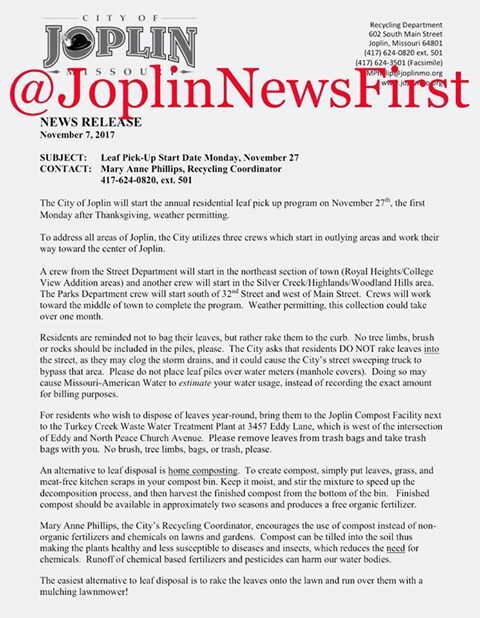 (64801/64804) -- The City of Joplin will start the annual residential leaf pick up program on November 27th , the first Monday after Thanksgiving, weather permitting. To address all areas of Joplin, the City utilizes three crews which start in outlying areas and work their way toward the center of Joplin. A crew from the Street Department will start in the northeast section of town (Royal Heights/College View Addition areas) and another crew will start in the Silver Creek/Highlands/Woodland Hills area. The Parks Department crew will start south of 32nd Street and west of Main Street. Crews will work toward the middle of town to complete the program. Weather permitting, this collection could take over one month. Residents are reminded not to bag their leaves, but rather rake them to the curb. No tree limbs, brush or rocks should be included in the piles, please. The City asks that residents DO NOT rake leaves into the street, as they may clog the storm drains, and it could cause the City’s street sweeping truck to bypass that area. Please do not place leaf piles over water meters (manhole covers). Doing so may cause Missouri-American Water to estimate your water usage, instead of recording the exact amount for billing purposes. 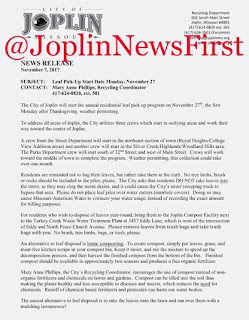 For residents who wish to dispose of leaves year-round, bring them to the Joplin Compost Facility next to the Turkey Creek Waste Water Treatment Plant at 3457 Eddy Lane, which is west of the intersection of Eddy and North Peace Church Avenue. Please remove leaves from trash bags and take trash bags with you. No brush, tree limbs, bags, or trash, please. Democrat Claire McCaskill's Town Hall Meeting in Webb City - 1310 NewsTalk KZRG LIVE! What is This Symbol on your iPhone? Get Rid of It! 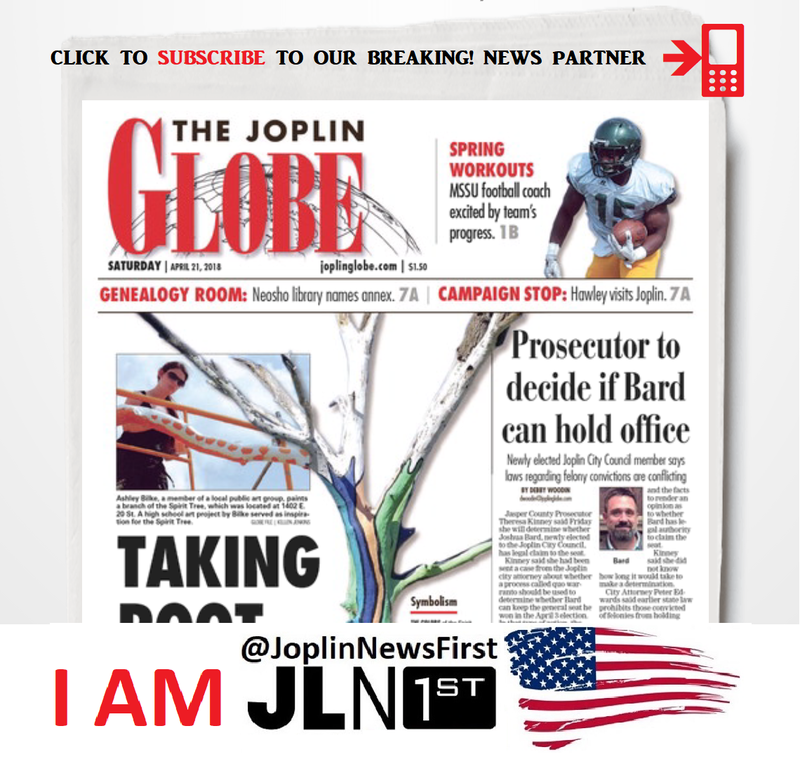 Joplin News First Platforms - Where Can You Follow Us? (64804/64801) — This Saturday is Veterans Day. In Joplin join us downtown at 10am for The 30th Annual Joplin Community Veterans Day Parade. 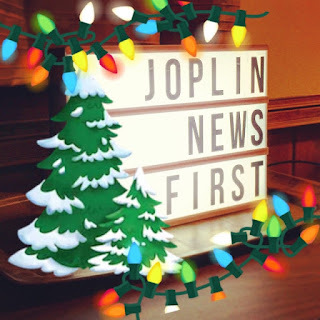 Joplin News First will broadcast the entire parade LIVE! as a first time to embrace a technology that can bring Veterans together. Also in that spirit of technology please create a FREE video to honor a veteran in your life. Perhaps someone living or someone who has already passed on...the tribute will only take a few moments. Thank youto our Veterans and thank you DAV for your tireless work to help Vets here in Joplin and across the country. DAV (Disabled American Veterans) is a 501(c)(3) government recognized not-for-profit organization. They own 2 Thrift Stores in Joplin and 100% of the profits go to Support Veterans with medical items, housing, employment support, mental health needs and/or travel to doctor appointments. 30th Annual Joplin Community Veterans Day Parade - Joplin News First Broadcasts the Parade LIVE! (64801) -- Joplin News First and our sister page Joplin News Past is excited about the One Joplin initiative to get neighborhood groups communicating on social media for safety and projects just like this sign. 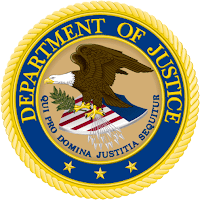 Communicating regarding: Crime? A lost pet? Celebration? Drug activity? Vacant properties? For Sale properties? Missing children? Stolen items? Illness? Knowing the name and boundaries of the place where you live is the first step in building a Joplin community where neighbors thrive together. Much like finding out the name of a new acquaintance, there is something about knowing a place's name, that builds a sense of connection and pride for that place. (64801) – H&M opened their doors today at the Northpark Mall near JC Penny. And just in time as the busiest shopping season of the year begins. They are open until 9 tonight. Thanks to Joplin News First friend, Chyna, for shooting this video for us! H&M has a clothing recycle program. If you bring 3 items to recycle you can receive 15% off your purchase. They take the donated clothing and recycle them to make new garments or possibly donate them to a charity. Google ‘celebrity & H&M’ and top of the search are photos including, Kristen Stewart in H&M pants, Michele Williams in an H&M gown, Penelope Cruz in an H&M dress, Solange Knowles in an H&M suit just a few of the trend setters that sport the Swedish clothier. Keep in mind if you bring clothing to be recycled they need to be in a bag. Also these recycled items can be anything made out of fabric, IE clothes, curtains, table clothes, etc. H&M stands for Hennes & Mauritz with clothing for men, women, teens and children. It operates in 62 countries with over 4,500 stores. It is the second largest global clothing retailer next to Zara.